FITC conjugated Mouse anti Canine CD3 and PE conjugated Rat anti Canine CD8 (DC047). All experiments performed on red cell lysed canine blood gated on mononuclear cells. Anti Canine CD3 / CD8 dual color reagent is a dual colour reagent recognising canine CD3 and CD8 cell surface antigens. Clone CA17.2A12 recognises canine CD3, a T cell differentiation antigen expressed on mature T lymphocytes. 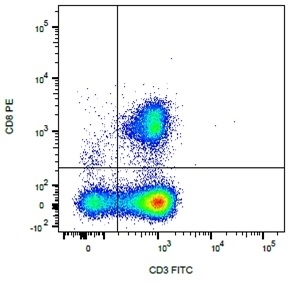 Clone YCATE 55.9 recognises canine CD8, which is expressed by cytotoxic T cells. YCATE 55.9 binds to CD8 alpha. Sakai, M et al. (2006) Phenotypic analysis of hepatic T lymphocytes in a dog with chronic hepatitis.